A 55 yo male brought to casualty with history of 3.5hr sudden onset left side hemi paresis. Referred to neuro interventional unit with a suspicion of recent onset stroke in window period. MRI brain Diffusion done immediately. Mean while blood sample sent for sugar level evaluation. MRI Brain Diffusion shows Restricted Diffusion along posterior limb of bilateral internal capsules with Blood sugar level 45 mg/dL suggestive of Hypoglycemia induced reversible signal abnormality on MRI diffusion. HE known to present with focal neurological deficit and may mimic stroke. Hypoglycemia is decrease in serum glucose level less than 50 mg/dL, commonly induced by overuse of insulin or oral hypoglycemic agents. Glucose is the main energy substrate and profound hypoglycaemia known to cause neuronal death in pathologic studies however the vulnerability of different brain regions to neuronal damage in hypoglycaemia is different. Presentation of HE is variable depends on the area affected as per its vulnerability and severity of hypoglyemia. Neurologic symptoms include giddiness, focal neuro deficits, coma and death in ~3%. May present with hemi paresis and mimic acute stroke. MRI Diffusion imaging demonstrates alteration of the diffusion of water within the extracellular space and between intracellular and extracellular spaces, may demonstrate changes suggestive of hypoglycemia by the restricted diffusion in the affected area. Splenium of corpus calloum and bilateral posterior limb of internal capsules are the commonly affected areas. Pathogenetic mechanisms for diffusion restriction in HE include energy failure, excitotoxic edema, and asymmetric cerebral blood flow. Glucose deprivation leads to arrest of protein synthesis, incomplete energy failure and loss of ion homeostasis, cellular calcium influx and intracellular alkalosis. Excitotoxic edema in contrast to cytotoxic edema, does not imply neuronal damage, this is the reason signal changes on MRI diffusion in HE are usually transitory and completely reversible after glucose infusion. Recent seizures episode, drug toxicity, viral encephalitis, and metabolic encephalopathy may show similar reversible signal abnormality on diffusion should be considered in imaging wise DDs. Diagnosing Hypoglyemic encephalopathy requires clinical suspicious and its confirmation with blood glucose which is easly available, cost effective and should be the first step in diagnosis of HE and not the MRI. Role of MRI Brain Diffusion in HE to evaluate topographic distribution of signal abnormality of hypoglycaemia which decides severity and prognosis of HE. If signal abnormality is confined to WM such as the CC, IC, or CR and the signal abnormality regresses on follow-up imaging carries good recovery without a neurologic deficit. If lesions are detected in the cerebral cortex, BG, or hippocampus and the lesions do not regress on follow up imaging is associated with poor outcome. The time necessary for hyperintense lesions on DWI to disappear after glucose infusion in humans is not completely clear. 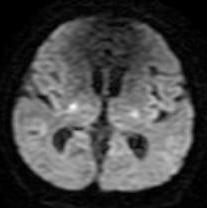 Diffusion MR Imaging of Hypoglycemic Encephalopathy, E.G. Kang AJNR. Diffusion-Weighted MR Imaging in Early Diagnosis and Prognosis of Hypoglycemia, L. Loa AJNR.